A small book that I wrote as a result of bragging to my daughter that I could do better than some of the current authors of childrens' books. I'm on my way to see the CPU. Billy is a Bit - a tiny element in the Memory Component of a home Computer - and he's bored, very bored. His whole life consists of standing up and sitting down on demand without ever understanding why. So one day, when the officious Barry, the Parity Bit of Billy's section, orders him to sit down, he doesn't. He crouches. Utter confusion ensues: Billy is IN-DE-TERMINATE, and that means that the whole System - the Computer in which Billy lives - cannot function properly. Perhaps Billy's job is more important than he ever imagined . . . . .
As someone who started working with computers in the days when 'memory' consisted of punched cards and who actually soldered the individual resistors, capacitors, integrated circuits and other components onto a board to create his first home computer, Don Johnson has watched the development of the 'PC' with great interest. As a programmer and an I.T. Manager he was involved with the use of a variety of computer types and systems, and learned a number of the languages needed to get them to perform their business and personal functions for users. In the early days, when enthusiastically trying to explain the technical workings of a PC to his wife, he reduced her to a state of eye-glazed brain spasms, and killed her interest in the topic stone-dead! His - first(only) - published book takes an entirely different approach, using a simple story about characters living inside a PC to provide an insight into its workings in a painless, but interesting and amusing manner. Children may concentrate on the story, teenagers and non-technical adults will discover how their PC actually works, and experts can compare his visualisation of the technicalities with their own - truly, something for everyone! Don retired in January 2005, having had many and varied interests in his life. These range from dancing on roller-skates at Alexandra Palace and the early days of scuba diving in his youth, through Round Table, skiing, photography and creating electronic gadgets, to his current involvement in Rotary, clay pigeon shooting, woodwork and making two street-busker's organs - complete with monkey! Before she retired, his wife, Avril, created enamel jewellery which they sold at Craft fairs, and Don built a computer-controlled milling machine to cut some of the more exotic copper shapes that she used. Avril is nowadays heavily involved with patchwork. Don hopes to write more books, but his other interests, his move to Somerset and an increasing number of grandchildren may distract him from this aim. Chapter 1 - Rebellion ! Billy the Bit was bored! There was no doubt about it, he was bored! Life just seemed to lack anything interesting happening. Every few microseconds (a very short time to humans, but an age to Billy), he would receive an instruction from the superintendent, Mr. Write. If he was sitting down, this would tell him to stand up, or if he was already standing up, it would tell him to sit down. The next instruction would probably tell him to change back again, or might even tell him to stand up when he was already standing up, or sit down when he was already sitting down! Really, it was just so boring! Sometimes ages and ages went by without Mr. Write even speaking to him, and the only highlight he could look forward to was the occasional visit from Mr. Read, who would look at Billy to see if he was standing up or sitting down. If Billy was standing, Mr. Read would then put a '1' (one) beside Billy's name on his list, but if he was sitting down, a '0' (zero) would be entered. It all seemed so pointless to Billy, and he longed for something exciting to happen to relieve his boredom. He had often asked his neighbours, Ben on his left, and Barry on his right, if they were bored too. However, they seemed quite happy to carry on standing up and sitting down, sitting down and standing up, standing up and sitting down, on and on, without feeling the slightest trace of boredom. Now Billy was not a round peg, but he certainly was in a square hole! He was a tiny, tiny part of the memory of a computer. In fact there was nothing smaller than Billy, Ben or Barry in the whole machine, for they were Bits. He and his eight immediate tiny neighbours, Ben, Barry, Bob, Brian, Brad, Bjork, Bruce and Basil, formed a team called a Byte, but even then they were still a very insignificant part of the computer. Although the other members of his team seemed to be happy with their boring life, Billy liked them all, although Basil could be rather toffee-nosed sometimes because he thought he was rather special. That was because he was a Parity Bit. His job was to look at all the others in the team and decide whether to stand up or sit down so that the total number of them standing up was always an odd number. Billy rather envied Basil, because he at least had to decide something for himself, rather than just obey Mr. Write all the time. Sometimes Billy hoped that he would be promoted to be a parity Bit, but he felt sure that he would soon become just as bored with that job, because even that seemed so pointless. There just seemed to be no excitement anywhere that he could see. He had often heard the stories about there being thousands of bytes like his team all joined together in a group called a Kilo-byte, and even of millions of them forming a Mega-byte, but they all sounded like fairy-tales to Billy. Sitting in his tiny square hole in one of the many memory chips of a computer it all seemed to be so far away and beyond his understanding. He yearned for something unusual to happen, but nothing ever did. Billy finally decided that if nothing exciting was ever going to happen, then he would have to do something himself. It was fairly easy to make that decision, but the problem was, what to do? Billy did not have many options. Standing up or sitting down were the only things he knew, so he racked his brains for some way to make an impact. After ages and ages of head scratching and pondering, he finally came up with an idea. The next time he received an instruction from Mr. Write, he would not stand up, and he would not sit down. He would crouch! Having made his decision, Billy could not wait for the next instruction from Mr.Write, but, as so often happens in life, when you are waiting for something to happen it seems to take for ever. After what seemed ages to the impatient Billy, an instruction arrived. As Mr. Write whizzed past in his usual brisk manner, he told Billy to stand up. Billy rose from his sitting position, but instead of standing upright like a soldier on parade - as all Bits are taught to do when they were trained in the formatting school - he stood with his knees bent and leaning forward at the waist. It was not very comfortable at first, but Billy soon got used to his new stance, and he waited for something to happen. The first one to notice that Billy was doing something unusual was, of course, Basil. “I'm being in-de-terminate,” replied Billy, using a long word that he had sometimes heard Mr. Read say. He hoped it meant 'not one thing or another', and although he was not sure, it certainly sounded a very important word to be able to use. “Well I don't know!” huffed Basil, who was obviously quite put out at having his authority challenged. “You just wait until Mr. Read comes, he'll sort you out!” All the other Bits in Billy's team had been listening to the exchange between Billy and Basil, and when they heard Billy say he wanted to be different, there was a sharp collective intake of breath. Although they were themselves quite content with their jobs, they were quite happy to see someone else being rather naughty. But they were amazed at Billy's daring, and they were all agog to see what would happen. If they had been humans, one could have said that they were 'thrilled to bits', but as they were Bits already, this phrase was not really very appropriate. Sufficient to say then, that they were all very, very excited! When Mr. Read came rushing by, he had to come to an abrupt stop as he saw that there was something wrong. He looked, looked again, and then looked a third time, but he still could not get a clear picture of the state of all the members of Billy's byte. One of them, Billy, was sort of 'bent', and Basil was bobbing up and down in a very silly fashion as he tried to decide what to do. Mr. Read took off his spectacles and polished them, then tried again. But it was no good! No matter how many times he tried to 'read' the situation, he could still not decide what to put down on his clipboard. Mr Read, like the other more senior members of the system, had been well educated, and he used the word data to describe the information that he collected when looking at Bits and Bytes. Instead of strings of ones and zeroes, he could even write things down in hexadecimal code - which sounds very complicated, but is simply a shorthand way of writing the same thing. Unlike humans, who have only ten fingers (including thumbs), Mr Read had sixteen - eight on each hand. This made it very easy for him to use hexadecimal, as it simply means counting in sixteen's instead of in tens. But all his education, and his extra fingers could not help him now - he just could not get a proper answer to write down. Mr. Read was obviously very flustered, as this sort of thing was very rare in his experience, and he had forgotten what to do. He scratched his head as he thought and thought, then he finally remembered something from the days when he had received his training during the installation program. “I have to send an IRQ,” he cried, waving his clipboard in the air. “It's an Interrupt ReQuest,” said Mr. Read, “I must send it straight away, without any delay,” and he hurried off, flicking though the papers on his clipboard to find the right form to fill in and send. The other Bits in Billy's team felt the same way, but none of them were brave enough to say anything out loud. They just whispered excitedly amongst themselves, wondering what fate would befall Billy. They did not have long to wait, because before you could say, “Napier's Bones” - which is an expression that the inhabitants of computers use, whereas humans use “Jack Robinson” - a Reset Pulse appeared. This was a very odd individual, with hair that stood on end as though he was constantly being surprised, and who carried a long stick with something that looked like a boxing glove on the end. He was holding the IRQ form in his hand, and he looked at it and the members of Billy's team very carefully to check that he was in the correct place. He appeared to make up his mind very quickly, and without further ado, he whacked each member of Billy's team on the head with the end of his stick - the padded end, luckily, otherwise it would have been very painful for them. Even so, they were taken very much by surprise, and it made them all sit down rather abruptly, even Billy. Ben, Barry, Bob and the others sat quite still, feeling a little dazed, but Billy was not the sort of Bit to take that sort of thing lying (or even sitting) down! His bold response was slightly inaccurate, because he jumped to his feet (so he did stand for it, really, but that wasn't the point) and stood there defying the Reset Pulse. This sort of reaction was obviously quite unusual, for RP (as Reset Pulse's friends called him for short) was quite taken aback, and it took him a few moments to realise that he was being defied. He lifted up his stick again, and tried to give Billy a really hard bash to sort him out, but Billy was ready for him this time. He ducked and dived - rather like a famous human boxer called Frank Bruno - and avoided the stick as RP tried again and again to hit him with it. RP even tried the rather underhand trick of jabbing Billy with the sharp end of the stick, but Billy was too quick for him, and easily swayed out of the way. RP became extremely red in the face, and very angry, but no matter what he did, Billy was to quick for him, and eventually he had to give up, puffing and blowing because of the unaccustomed exercise. You naughty little Bit,” cried the Reset Pulse, “I'm going to report you!” and he rushed away muttering comments about the behaviour of youth today - how they had no respect for their elders, and they needed a spell in the army to sort them out like when he was a lad. The other Bits stared at Billy as he stood there defiantly, and even Basil could not think of anything to say. It went very quiet for a while. Billy was starting to feel his bravado slipping away as he stood by himself, waiting to see what would happen next, but when the System Monitor arrived he was so over-bearing and self-important that Billy took an instant dislike to him, and that strengthened his resolve. The System Monitor was tall and thin, wearing a coat with lots of pockets from which sixteen's of pieces of paper protruded. (Humans would have said dozens of pieces, not sixteen's, using a word from the olden days when they counted in twelve's, but of course the System Monitor counted in the computer way). He kept flicking through the papers, one after the other, all the time he was talking, which he did in a very high-pitched and querulous voice. Well, Billy resented this remark very much, since he did not think he was being a lout (for although he was not very sure what a lout was, it did seem as though it must be very bad to be one). He was only trying to prevent himself being bored, and he felt sure that his small protest could not affect anything very much at all. Surely everyone had the right to be in-de-terminate (he used that word again as it seemed to be the right one) if they felt like it occasionally. When he tried to point this out, the System Monitor went very white, and looked as though he was going to faint. “We can't have Bits in a computer being INDETERMINATE!” he shouted at the top of his voice, “It threatens the very fabric of our existence. Everything we have worked for over the years, proving that ones and zeroes can do anything, could be lost if Bits behaved like you. What would become of us!” he wailed. At this, the System Monitor collapsed in a heap, and Basil - always ready to toady up to someone he thought was important - went and got him a glass of water. After a few sips from this, he seemed to gather himself together, and come to a decision. 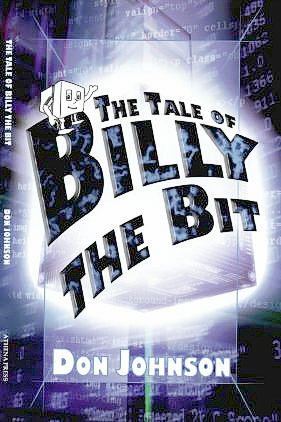 I have read your book Billy the Bit and I thought that it was brilliant I simply couldn't put it down. it was one of the best books that I have read in a long time and I read a lot of books. your book with all the different computer parts as characters and I did mine the same except with body parts. VERY CUTE. Fun and very infomative. Its good fun, and has you wanting to lean more and more about little Billy the Bit. At the same time, you get a very good and simple explanation of the insides of a computer. What or rather "WHO" does what, and how it all comes together. I now think of Billy and all his friends whenever my pc starts to play up. "Well, they say that the greatest things come in small packages. Congratulations, a truly excellent book. I would doubt that all but a few Authors would have the power to shrink an adult and child to the size of a micron. To take us safely, on a wonderful educational and entertaining journey within a computer system. Yet you have used your magic with compassion. Our mouths did go a little dry with fear at some stages. Billy dared to be different and immediately won our hearts. We feared for his fate as the hierarchy tried to enforce obedience, without reasoning why - a common mistake. I cannot say that I have the actually considered the internal workings of a computer in such a microscopic and almost biological study. But your words have had a lasting effect. I often gaze out of the window while waiting for my brain to process an equation. In these rather quantum moments, my attention somehow turns to the large gray box in the corner. Amid its almost hypnotizing hard disk drives, whining away, you can almost hear the clock cycles frantically pedaling around. A most educational and entreating read for all ages." We both read the tale of Billy the Bit and we enjoyed it. This book is highly recommendable to everybody of any age. Those who want to know how a computer works, foreigners who want to learn or perfect their english language, as us, and all the others who wish to read a very good book ! "This is such a clever book. It is directed (but not exclusively; I enjoyed it) at a youngish readership, and this is an age group tha is today eagerly embracing the computer culture. A friend of mine told me the other day that he doen't need an IT consultant because he has a nine year old who seems to be able to solve any problem he may encounter. THE TALE OF BILLY THE BIT is warm and witty, and it is really informative. And if it can show the young computer buff that there is such a thing as a book, and that the two are not in any way incompatible, then it will have done a great job, besides providing entertainment and information. Billy the Bit is original and creative, and we will be pleased to offer Don Johnson a publication proposal". Purchase this 80-page book by clicking on this Link to Amazon in the US.